Jack Welch once said: “You are to control your own destiny or someone else will”. And I want to emphasize the need that one thing is to be destined, and another thing is to fulfill destiny. Your destiny lies in your own hand. This is why I agree with, Helen Keller when she said: ” I am the master of my fate, the captain of my soul, the owner of my earth destiny”. James Whitcomb Riley has this to say, “The most essential factor is persistence, the determination never to allow your energy or enthusiasm to be dampened by the discouragement that must inevitably come”. The secret of success is constancy of purpose. “Benjamin Disraeli said: He that must be successful must see destiny as something you must do and not a chance or luck. Be ready to do what it takes. The bible say in Genesis 25:29-34 “And Jacob said, sell me this day thy birthright and Esau said, Behold, I am at the point to die, and what profit shall this birthright do to me? And Jacob said, swear to me this day, and he sware unto him and he sold his birthright unto Jacob. Then Jacob gave Esau bread and pottage of lentils, and he did eat and drink, and rose up, and went his way, thus Esau despised his birthright”. Sometimes ago, I said “To be destiny is not what counts but how you handle your destiny and value it, is what counts”. Easu did not value his destiny and he lose it by a mere food. Yes, it is true that we are all destined to achieve success in life. But why are many people becoming failures and so many living in abject poverty? The answer is that, true success and great achievement in life, is for those ready to do what it takes to fulfill their destiny, and not for those who because of their weakness are ready to sell their destiny for bread and pottage like Esau. 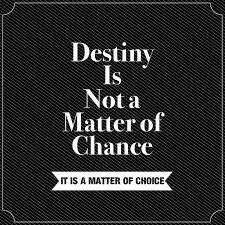 How you value your destiny determines the quality of your future. Being ready to do what it takes like Jacob is the key to true success and destiny fulfillment.